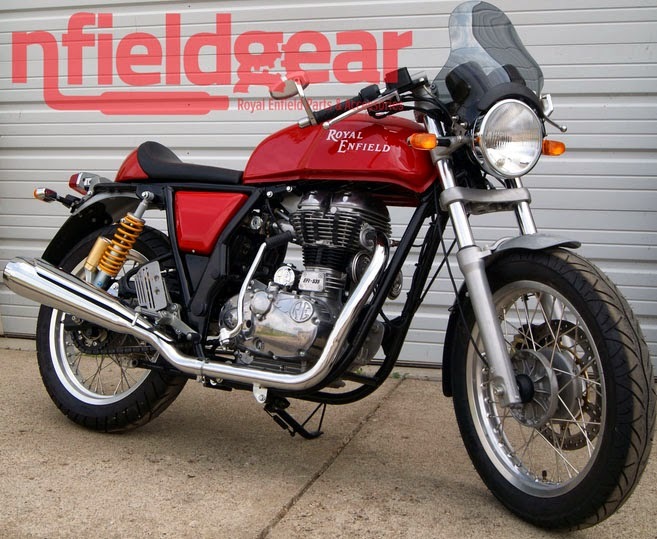 Yes, something is missing from the new Royal Enfield Continental GT. 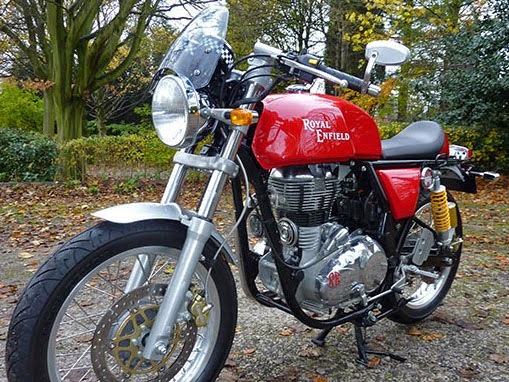 The stunning similarity in design inspiration of the new Royal Enfield Continental GT and the original, 1965 Continental GT is instantly apparent. 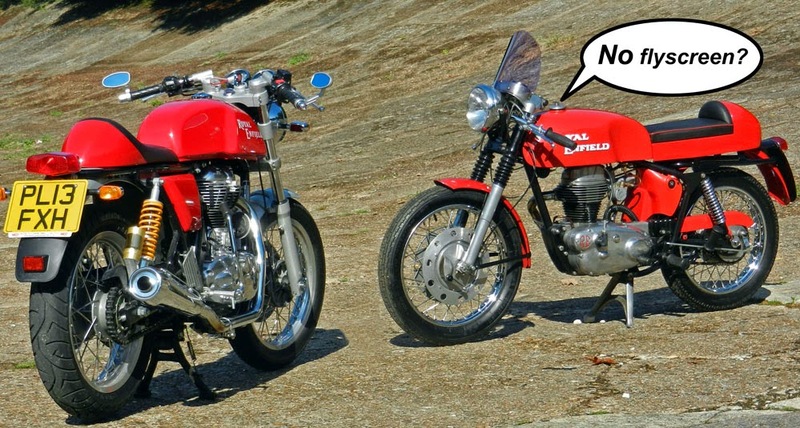 Seeing the Royal Enfield cafe racers, new and old, displayed together during the press launch in the UK, my reaction was that only one thing was missing from the new one. 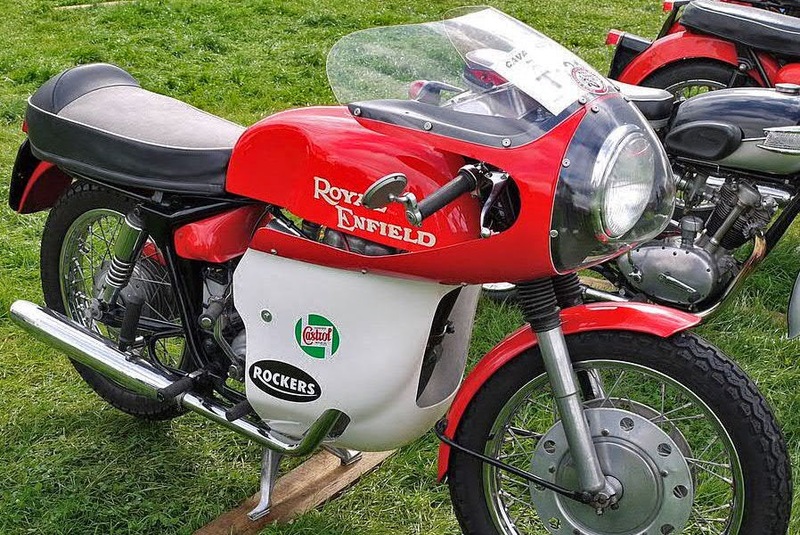 It had been that flyscreen, along with clip-ons, rear sets and cranked exhaust pipe, that had made the original the idol of teenagers in 1965 — when I, too was a teenager. 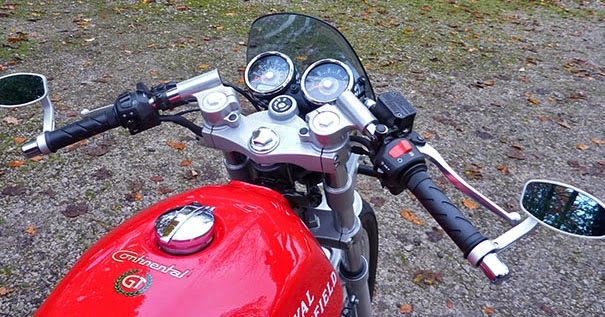 Now Dart Flyscreens Ltd. of London has gone to the trouble to create a flyscreen for the new Continental GT. The Dart flyscreen on the new Continental GT. "The original 1960s Continental came with a flyscreen as standard," Dart's website reasons. 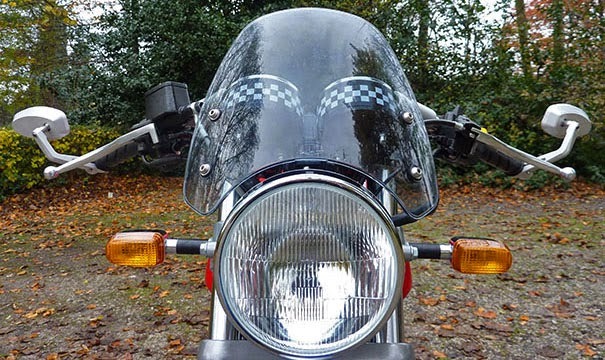 "What better partner for your modern Continental GT than a Dart flyscreen? In the same way that the modern bike uses up to date technology whilst retaining its period charm, the Dart’s top quality injection-moulded polycarbonate screen and laser-cut fittings serve to enhance an already handsome bike." The website quotes a price of $124.95, including delivery, in standard or dark tint. Just right? Or maybe a bit too small? How easy is it to fit? According to the FAQ "you'll need a couple of spanners or Allen keys, 20 minutes and that's it. The screen uses the standard headlamp brackets and if it's carefully fitted, you won't even need to readjust the headlamp." "When you're riding a naked bike, your body provides a big target for wind blast. Flyscreens work by taking most of the wind from this area, giving your body an easier time. You still get wind around the helmet area (but that's why you bought the bike, yes? ), but you don't get the fatigue in the same way." OK. Sounds good. But, oddly, although I think it's a clever idea, I'm not personally crazy about the way the flyscreen looks on the new bike in Dart's photos. Best looking angle is head-on. With its hunched, shoulders forward stance, the new Continental GT seems to overpower the little plastic plate. A seemingly larger, more curvaceous Italian flyscreen is listed for the Continental GT by NfieldGear at $139.95. Some might prefer it. NfieldGear flyscreen differs in shape. But you know what I would really like? Here's a photo of an original 1960s Continental GT fitted with the then optional Speedflow fairing, with transparent nose. 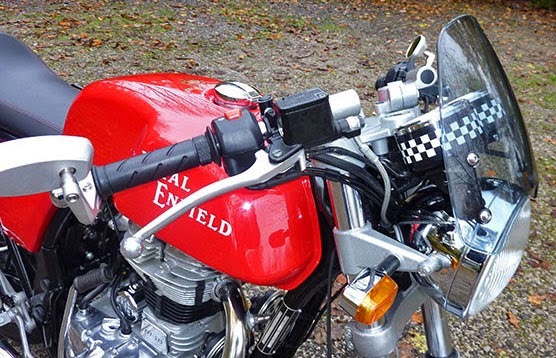 The original Continental GT with Avon Speedflow fairing. Gimmie one of those and I will feel like a teenager again.